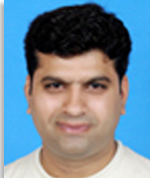 Dr. Nauman Raza is an Assistant Professor in the Department of Mathematics at the University of the Punjab. He has M.Sc. degrees in Mathematics and Telecommunications and a Ph.D. in Mathematics. He also worked as a postdoctoral fellow in Department of Mathematics and Statistics McMaster University, Canada. He has also served the University of Engineering and Technology and University of Management and Technology as Assistant Professor. Dr. Nauman’s research interests include scientific computing, computational fluid dynamics and nonlinear wave phenomenon. His research has been published in high impact journals including Journal of Computational Physics, Computers and Mathematics with Applications, Applied mathematics and Computation. He has participated and presented his research papers in many International and National conferences in his field. He has been acting as a referee of some reputed journals like Journal of Computational Physics, International Journal of Computational Methods etc.